The shot that will be replayed in Dorman basketball history was Zach Butler’s best look of the night. Harassed all over the during the 5A boys championship game by Blythewood’s tenacious defense, Dorman’s All-State senior guard attempted just six shots and scored a total of six points. 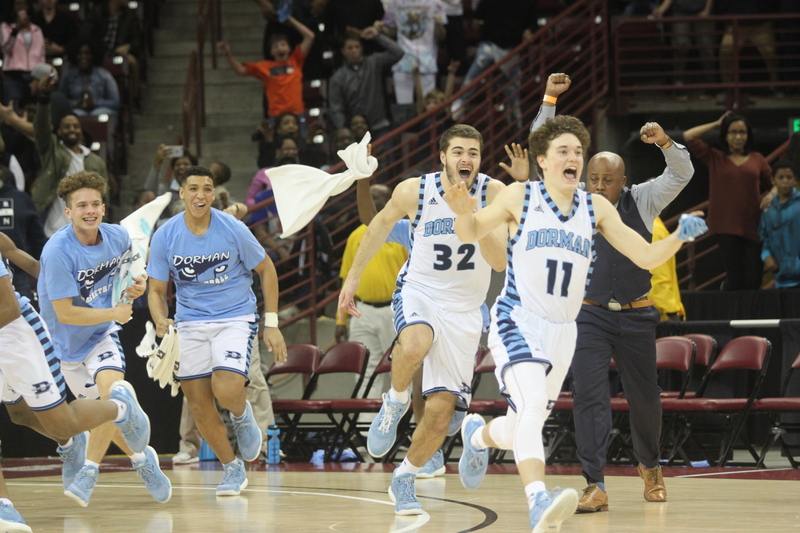 The last two came with 21 seconds left and staked Dorman to a 54-53 lead as the Cavaliers held on for a 55-53 victory and the school’s first-ever boys basketball title. The play, a simple backdoor cut against a defensive overplay, provided the last of seven lead changes in a game that saw neither team lead by more than seven points. Called “Tomahawk”, the Cavaliers set the play up in a timeout. Freshman Myles Tate took an inbounds pass in the backcourt and dribbled toward the top of the key, shed his man as he went left and fired a perfect bounce pass to Butler, who had used a hard fake toward the top of the key to get space on his defender for a backdoor cut. The lead changed hands four times in the last two minutes of the game, with Kameron Riley giving the Bengals a 51-50 lead for their first advantage since 9-5. Tyson McClain hit a layup to push the Cavaliers back in front with a layup before Keith Matthews scored to make it 53-52 and set the stage for Butler’s big shot. Tae Cannon secured his ninth defensive rebound of the night on Blythewood’s ensuing miss and knocked down one of two free throws for the final margin. Blythewood’s last offensive chance was a 3-pointer to win that bounced off the front of the rim. Tyson McClain, who led all scorers with 13 points, had just two in the second half. His bucket down the stretch, though, pushed Dorman back in front at a crucial moment. That intensity showed until the end, and as the Cavaliers celebrated around him, Ryan reflected on the moment.